OpenPonk is an open conceptual modelling platform. It started as an experimental project exploring a possiblity to complement Eclipse EMF and GMF by a more concise, comprehensible and expressive alternative. The hypothesis was that it can be achieved by leveraging Pharo's straight-forward dynamic purely object-oriented language instead of Java's torpour and ceremony. OpenPonk leverages Roassal (specifically Trachel) and it has become a solid foundation for conceptual modelling and diagramming projects, such as an multi-agent modelling for CIRAD or Normalized Systems Modeller. The most versatile part of OpenPonk is currently probably a complete UML bootstrap from OMG specification, however its aim is to be a powerful partner for any conceptual modelling endeavours, be it model-driven software engineering, enterprise engineering or other engineering disciplines dealing with complex models and diagrams. 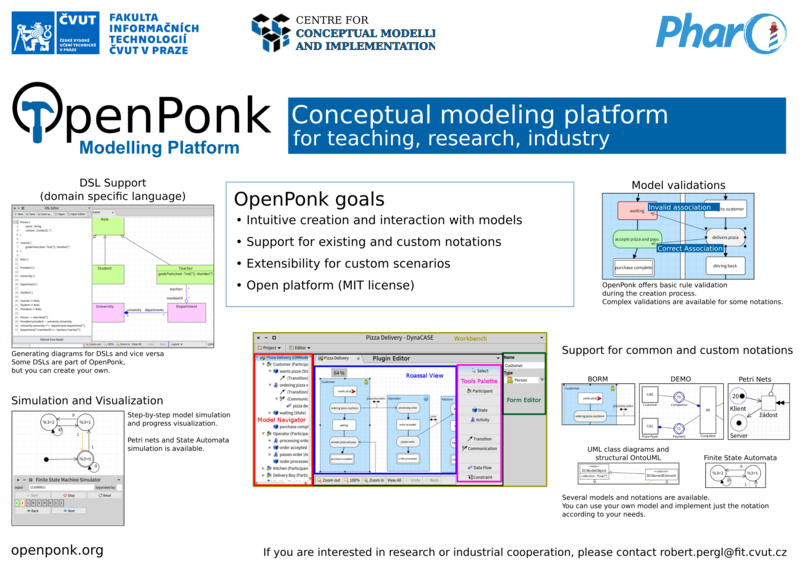 "OpenPonk is a realisation of my dreams of a platform, in which researchers, students of all levels and practicioners in their daily work can easily materialise their thoughts, without reinventing the wheel" explains the project lead, Dr. Robert Pergl, Head of the Centre for Conceptual Modelling and Implementation at the Faculty of Information Technology, Czech Technical University in Prague. Made with love by Nico, Esteban and Damien @RMoD. The design was kindly provided by Aurélia Saout.